Way back when, before comic book crossovers became an hourly thing, seeing two heroes from disparate books on the same cover still had the ability to make the heart skip a beat or two. This is the fourth crossover between the Flash and Green Lantern (not counting the Justice League books) and in many ways it’s the best of the bunch. It’s a tight little John Broome romp the sets up an intriguing A plot and an equally tantalizing B plot and then neatly dovetails both stories at the end. The A scenario starts with the Allen newlyweds in a car as Iris is dropping Barry off at the police station to catch up on some work. She reminds him to check to see if there is any word at the station from Hal Jordan (AKA Green Lantern) who was coming into town to meet them, but who’s been a no show. In his lab, Barry is confronted by one of Green Lantern’s Guardian of the universe bosses who tells Barry that GL is missing and asking Barry as the Flash to look for him. As the Flash whizzes around the city searching for GL, he runs right past the house of the B plot. The resident in the house is Hjalmar Helms (really), a wealthy recluse who has spent his life trying to build a machine that will take him to the future. In the books on his shelf, author Broome name checks some of his SF heroes such as H.G. Wells, Manly Wade Wellman and John Taine. One of Helms experiments goes a bit wonky and produces a purple radiation that allows him to simply think of something to make it happen (sound familiar?). As we all know, a purple radiation that appears in the first act, always shows up in the third and this tale is no exception. Some crooks steal the purple radiation device and go on a crime spree. The radiation helps them defeat the Flash when he first encounters them by conjuring up a sleeping gas to knock him out. That night as Barry watches TV with Iris at home, they spot Hal working on a fishing boat in a local news story. 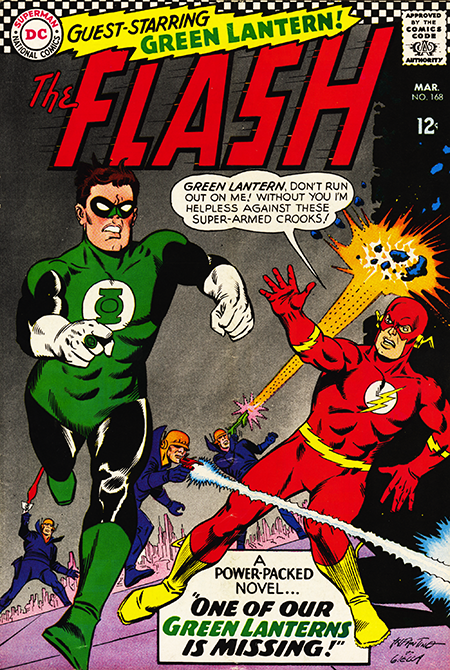 The Flash finds Hal who it turns out has amnesia. The Flash helps him to remember who he is by having Hal charge his power battery. We then find out that the purple radiation had caused a backfire surge to flare from the battery and knocked Hal unconscious giving him amnesia. The A plot and the B plot meet up and shake hands when it’s revealed that the power battery had imbued the purple radiation with GL’s power allowing the crooks to just think of thinks to make them happen. The crooks are then caught and Hjalmar Helms vows to never mess with time machines again. I think that what makes this such a winning tale (aside from the wonderful Infantino/Green art) is that at its core it’s a buddy story that revolves around the real and genuine friendship of the two heroes who not only share that camaraderie but also their alter ego bond. The issue also has an extra letter letters page to accommodate the debate over whether or not Barry should tell Iris he’s the Flash. Stay tuned on that one.